javabeans: Hey, check out the poster for Answer Me, 1988. I was expecting more terrible ’80s fashion, actually (not that they look good…). girlfriday: Wait, where’s Park Bo-gum?? Is he not in this drama anymore?! javabeans: No way, that can’t be it! He’s gotta be there somewhere… still looking… Ha, well Go Kyung-pyo looks all of twelve years old… OH I SEE HIM. Look for the bowl cut. girlfriday: OH, there he is! It looks nothing like him. javabeans: It kind of looks like him. He has that skinny, angled face. girlfriday: Under a giant helmet of hair. I was just looking for the cute boy, and got lost. javabeans: Well, expecting cute was your first mistake. Answer Me is all about turning cute into frumpy, old into new, dated into fashionable. It’s the hipster dream. girlfriday: I do like how awkward everybody looks, and I can’t stop staring at Kim Sung-kyun, who was Samcheonpo in Answer Me 1994 and now playing one of the dads. javabeans: Whoa, lookit all that gray! So for 1994 he was playing 15 years younger, and now he’s playing 15 years older? I wonder if he’ll have fun talking down to Sung Dong-il, considering how Samcheonpo had to look up to him. girlfriday: I hope they play bickering neighbor ajusshis who compete for everything. My favorite thing about the poster is the three moms in the center, all with the same hair. javabeans: My mother had that hair. I’m pretty sure I had that hair. If they really wanted to be true to the ’80s, at least one of the young girls oughtta have wild pama hair. Preferably short and bush-like. girlfriday: Or feathered, with a wall of bangs. Let’s be honest, the ’80s were not a pretty time. But hopefully the series will amount to more than hair jokes and a trip down bad fashion lane. They say that this installment will be family-centric, not that that’s very different from previous seasons. javabeans: That makes the cast a lot bigger, which kind of feels like we’ll be getting a triple dose all at once. I just hope the episodes aren’t three times as long. girlfriday: Just shoot me now. That won’t happen, right? javabeans: Do you want the truth, or do you want me to make you feel better? javabeans: On the upside, I’m sure they’ll be very funny, heartfelt, nostalgia-tinged, tear-inducing three-hour episodes. javabeans: You’ll love them! It’ll make you laugh and cry! Just… you know, over and over and over again with nary an editor in sight. javabeans: Just think of it as recapping a sixty-episode drama. In ten weeks. girlfriday: I thought you were trying to make me feel better. 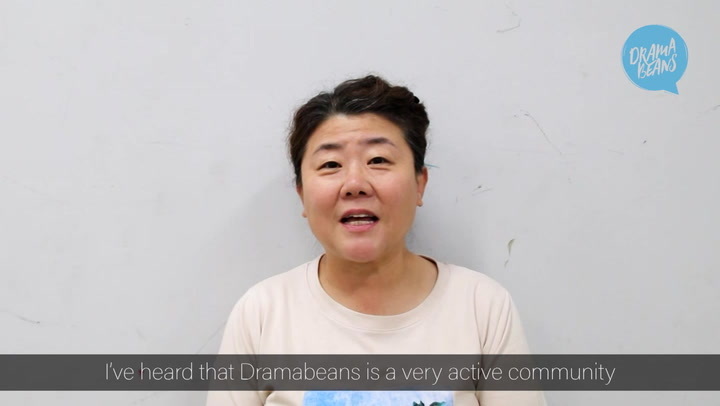 javabeans: I go where the truth takes me. Is park bo gum the man in black sweeter? ah, nope. he is beside the black sweater man and is in grey sweater. Is Park Bo Gum not the lead? Why is he in the corner? Park bo gum is in the second row with white sweater n bowl cut hair ? I know right! I just LOL'd when I finally found him after JB mentioned the bowl cut haha They all look adorbs! Park Bo Gum...light gray hoodie on the end of the second row...next to the guy in the black sweater. Oh my goodness, I love it. Sooo excited for this! Something about Korea in the 80s fascinates me. JB: "Just think of it as recapping a sixty-episode drama. In ten weeks." Watching 60-ep drama is a feat and now recapping?? Bless your souls, JB and GF.. Wait...is it really 60 episodes long?!?! Haha they're just joking about how the episodes for Answer Me 1994 were so long that if they get even longer for 1988 then the running time would be equivalent to a 60-episode drama. oh phew! I thought they were being serious. I loveeeee reply series, even with all their shortcomings, but 60 episodes? I can barely hanging on to 24. Can I confess? I totally ship Dong Il ahboji and Il Hwa omma. Especially the one for reply 1994, they're so lovey dovey to each other, that I can't remember of any other older married couple in kdrama who act that way. Nice to see how was Korea in their 80s. three hour episode ... LOL! I loved both the 97 and 94 versions, but somehow '94 moved me even more, even though yes the episodes got really draggy at times. I'm looking forward to this one so much. Can't wait! But Reply 1994 will always have a special place in my heart... LOVE Trash Oppa!!! Love him too...and Chilbongie will forever hurt my heart. The only fault I see is that the actresses look too skinny. Back then people weren't as thin as nowadays. And since the fashionable clothes were so baggy, they could get away with it. Oh now that you told me, I think I can see her! lol yeah it is really bad. It looks like she got the short end of the stick compared to Sung Dong-il. Isn´t she the one in the middle of the three women at the back? The first people I looked for were Kyung-pyo and Bogum, because I was wondering who is going to be the lead. So it is between Kyung-pyo and the other guy in black next to Hyeri? Can somebody tell me who is the guy in black? I think it's still hard to tell who's gonna be the lead :S...considering they've played the husband games for so long on reply 94 lol. I feel like I'll just spend the first two eps of this laughing at everything until I settle down and get used to the style. Super excited for this !!! The poster is brilliant, there's a few actors I couldn't spot right away. For some reasons Lee Dong-Hwi remind me of Jo Jung-Seok in architecture 101 ^^. So excited for this! I also immediately looked for Park Bogum and had to zoom in just to spot him. 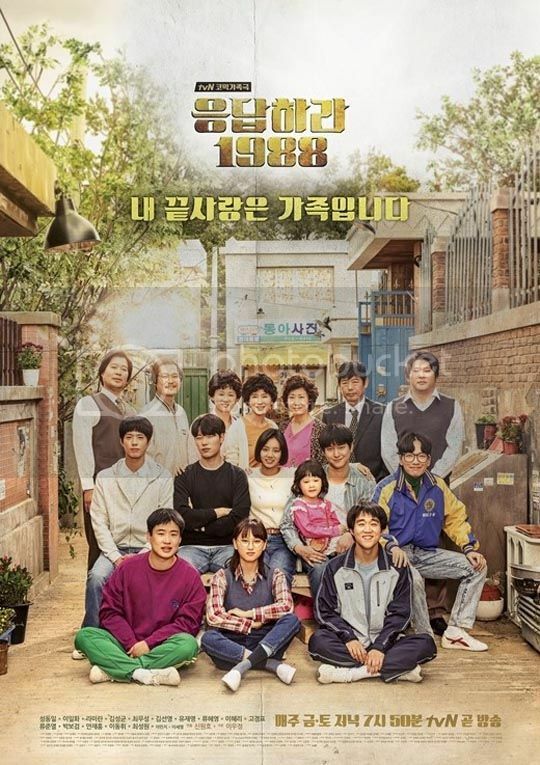 I don't know anything about the 80's in Korea, but not knowing how the country was in previous decades didn't stop me from watching both of the previous installments of Reply. It they keep episodes with a time of 1h and 5 minutes as it's being said on mydramalist, the drama has everything to be almost perfect (because there's no perfect drama, of course. Ok, just Misaeng, haha!). 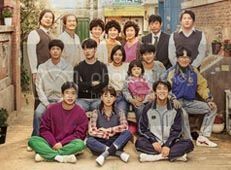 Reply 1994, in my opinion, made a huge mistake with those 1h40min long episodes. Though all, the story is good even though the draggy aspect annoyed me a lot. The number of episodes and the running time of 1997 was simply perfect and made the story more enjoyable. If we are going to watch the husband game again, can Go Kyung Pyo win? I really like him and it will be great to see him as a lead. And also Park Bo Gum! He will probably still look gorgeous even with this hair, he is really good looking. But I guess this time they will do something entirely new, like make us confused about more than one couple. Until the end we will not know who will end up with who because of hidden feelings, unrequited love, etc. A little like the beginning of 1994, in which we didn't know with who Yoon Jin will end up, if it is Samcheonpo or Haitai. But I can see Go Kyung Pyo right away (keywords: smile). Can't wait to watch what 80's is like. My obsessed Lee Min / Lee Yoon Hoo self found Park Bo Gum instantly. I also looking for Park Bo Gum immadietly after the poster show up. And is Park Bo Gum's hair looked simmiliar with Min's hair for IRY's 4 last episode? Or it is just me? 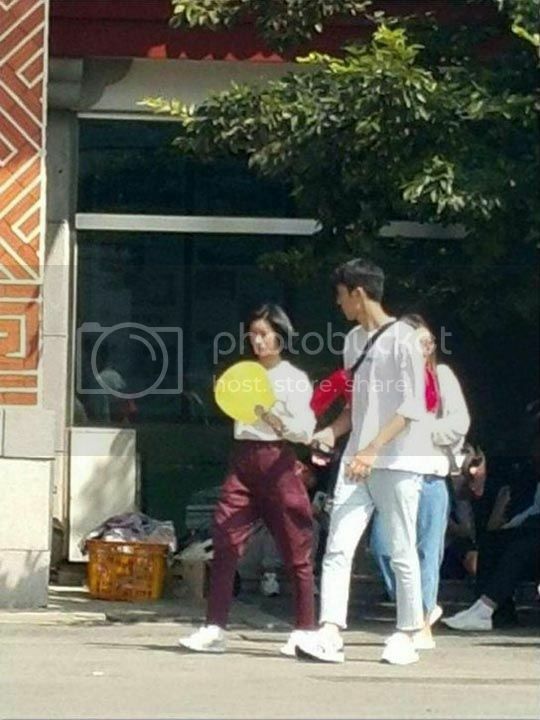 Park Bo Gum? Where? Where? Wheee.... ??? There???!!! 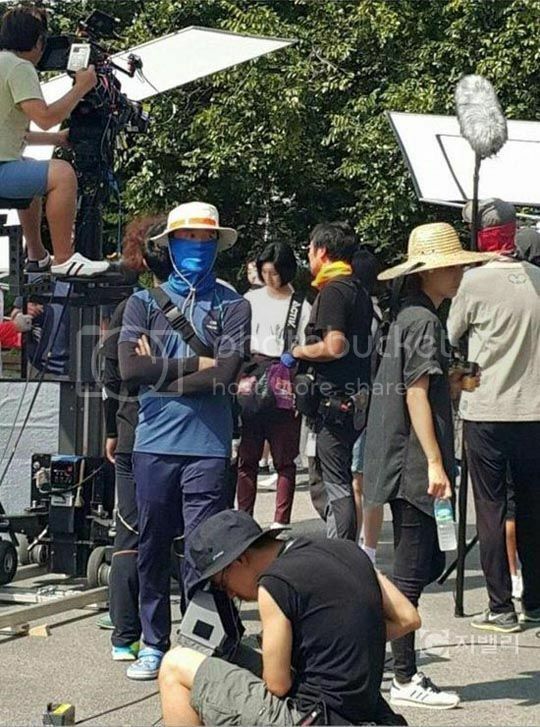 Go Kyung Pyo? Wher... Oh. ? Kim Sung Kyun? *checks the kids line up* don't see him. *checks the ajusshi line up* ? GAH! I CAN'T WAIT FOR THIS. Seems like SK had bad fashion/style/hair during the '80s as well. But really, why does "Ajumma hair" still exist? (Yes, I know, going shorter is easier to take care of and perming/adding curls gives the appearance of more volume, etc.). I can't wait to see what they do with this series!! Will be totally nostalgic for me, I was in high school during this time. Korean version of lots of hair spray, teased bangs and military jackets and hammer pants. Totally going to check this out for Park Bo Gum. I was super impressed with his acting in "Hello, Monster." He was fantastic, absolutely fantastic as Min-ah.